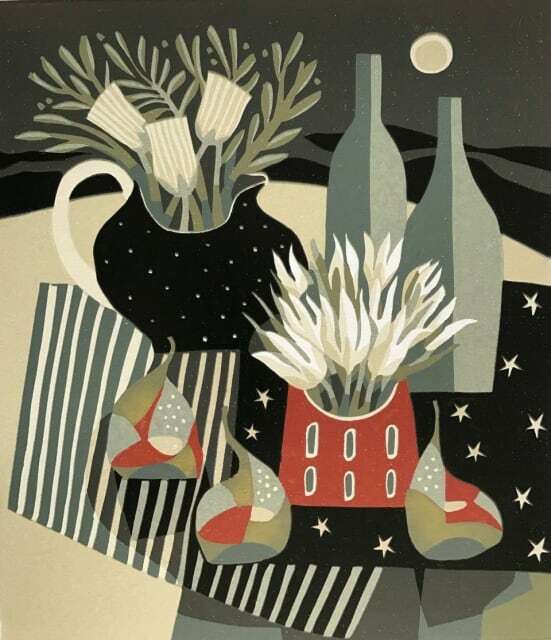 Jane Walker's prints reveal a fascination with still life, her colour palette and graphic sensibility reflecting her love of 20th century artists and craftsmen, 50s textile design and Scandinavian ceramics. Ordinary things, flea market finds, souvenirs, cherries, jugs, teacups, flowers combine to evoke a feeling, a memory or a sense of place. Jane studied illustration and printmaking at Duncan of Jordanstone College of Art in Dundee before following a career in Graphic Design at the BBC in London. In between she designed textiles and ceramics in Portugal and illustrated magazines in her native Scotland. She has now come full circle and returned to her first love, printmaking and particularly linocuts. Jane uses the reduction linocut technique to produce handmade limited edition prints which are made using a single block. Through each stage of cutting, inking and printing the image is revealed as the actual block is destroyed. A reduction print can therefore never be reprinted and it is sometimes referred to as the suicide technique as there is no possibility of going back to modify layers. Each edition is very small, usually between 12 and 16 prints.